WHAT ARE MANMADE BOARDS ? Manmade boards are commonly used in the construction industry, for interior fittings and furniture. They are more stable than natural woods and are less likely to warp and twist out of shape. The three main types are; plywoods (laminated boards), particle boards and fibreboards. They are all manmade in factories / mills. They are usually composed of natural woods and resin, which binds them together. Plywood is a composite material. Composed of individual plies / veneers of wood. The plies are glued together with synthetic resin. Plywood is less likely to warp or split, due to this construction. Supplied in a range of sizes and thicknesses. Softwood ply tends to be used in the construction industry for walls, roofs and floors. Hardwood ply often used for quality laminate flooring, kitchen units and some furniture. 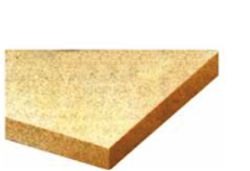 Manmade boards such as plywood, can be manufactured so that they are extremely wide. This makes plywood a popular material in the construction industry. A type of plywood. Built up with a core of softwood strips bonded together with adhesive and covered with a sheet of plywood on either side. Used as a building material and for furniture manufacture including fitted kitchens / bedrooms. A strong and heavy board, unlikely to warp and twist. The plywood faces are normally beech or other natural woods. A flexible form of plywood. Can be formed into various ‘curved shapes. Composed of several layers of thin plies. Flexi Ply is ideal for all applications which require bends and curves. This allows the flexi ply to be manipulated into curved shapes. Available in a range of thicknesses. Used in modern furniture and interior design where curved surfaces are required. This is made up of small chips of wood bonded together with resin and formed into sheets by compression. It is not as strong as plywood or block board, but it is not expensive. Chipboard is often covered with a plastic laminate or wood veneer and used in cheap furniture. A particle board. Interior and moisture resistant chipboards are available. A quality board, relatively cheap. Composed of fine wood dust and resin pressed into a board. Can be worked, shaped and machined easily. Paint can be applied to it, without the need for an undercoat or primer (although finishes better with an MDF primer). Used widely in the building, shop fitting and furniture trades. Made from wood fibres that have been pulped. The pulp is put under pressure until the fibres bond to produce a tough board. Standard hardboard is smooth on one side and rough on the other. It is not as strong as the other boards. Duo faced hardboard has two smooth faces. Used for hidden parts of furniture such as the back of a cupboard. 1. What are the three main types of manmade boards? 2. In general terms, what is the composition of manmade boards? 3. What are the three main types of plywood? How are they used? 4. What is special about flexi ply? Include one practical application of this material. 5. Write a brief description of chipboard. 6. Read the description below. Name the manmade board. A quality board, relatively cheap. Composed of fine wood dust and resin pressed into a board. Can be worked, shaped and machined easily. Paint can be applied to it, without the need for an undercoat or primer. 7. 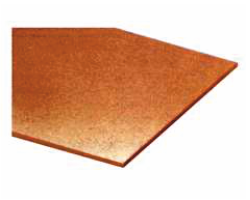 In simple terms, how is hardboard manufactured.